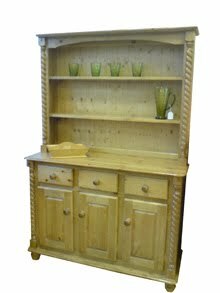 I recently ordered a welsh dresser online from a company called Wye Pine. I asked for the dresser to be left 'in the white' so not varnished or waxed etc so that i could have a go at painting it myself........perhaps a bit too ambitious for my first wood painting project whilst 8months pregnant but i like a challenge, particulary a creative challenge!!! Firstly i sanded down the dresser and got rid of any dust/dirt. I then gave the dresser a coat of white wood primer on the parts i wanted to eventually paint. I decided i wanted to use Farrow and Ball estate eggshell paint as it is supposed to be really good quality and ideal for furniture. After much deliberation i went for No. 4 Old white. It is a white paint with a slight blue/grey tone. I then used an antique pine wax for the top and door knobs. I really like the fact that you can still see wood on some parts of the dresser and it makes the whole dresser look a bit more 'country' inspired than if i had painted the whole dresser in a single shade. I have now displayed our collection of Sophie Conran china in the dresser and the grey tone of the paint works well with the bright white china as it really stands out.